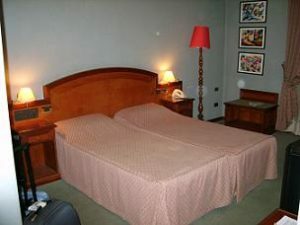 Hotel Rex is situated downtown between the Santa Maria Maggiore Church and the shopping street Via Nazionale. It’s 10 minutes walking to Central Station (“Termini”) and about 20-25 minutes to the Spanish Steps. Hotel Rex is a traditional hotel. 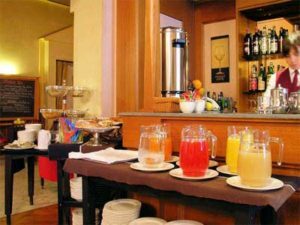 The 50 guestrooms are comfortable and have free computers and internet access, playstations, room service and air-conditioning. Cheapest price is for a small double room including breakfast. High-Tech Suite or a Suite with kitchen are over €300 and can sleep 4 persons. The breakfast room is near the reception and is a quite small area. Breakfast is in buffet-style. Coffee was excellent and handmade at the bar. We stayed in this hotel 4 nights in the summer of 2006 with our children. The guestrooms were nice decorated, quite and very clean. Our room was bigger and had a shower. The twin room of our children was smaller but had a bath and free use of a playstation. Overall, we were satisfied with this hotel but not with one staff member. The second day of our stay, €8 in coins disappeared from our room. I thought it was the housekeeping who had taken away the money. Afterwards with the checkout, i got a bill of about €11 for drinks and food of the minibar. Because i was sure we had not taken anything, we didn’t have to pay. The reception told me that a staff member was checking the hotel minibars. I am quite sure that this man was not only charging our minibar account but also took my €8. So if your staying in this hotel: don’t leave your money in the hotelroom but put it in the roomsafe. Also check your bill carefully.